Not that I have any doubt but yes... that was a disturbingly brilliant little doco MUN.... I wonder if all film makers are as weird as this chap?? Great video - rationality will always win over the conspiritards. myusernam said..Geez u have too much spare time on your hands!!! Does this all go on the bill of some poor client?! Hope u don't charge an hourly rate. And here we see the effects of our two Suns directly from NASA archives.. I don't see anything wrong with the perspective of the shadows. 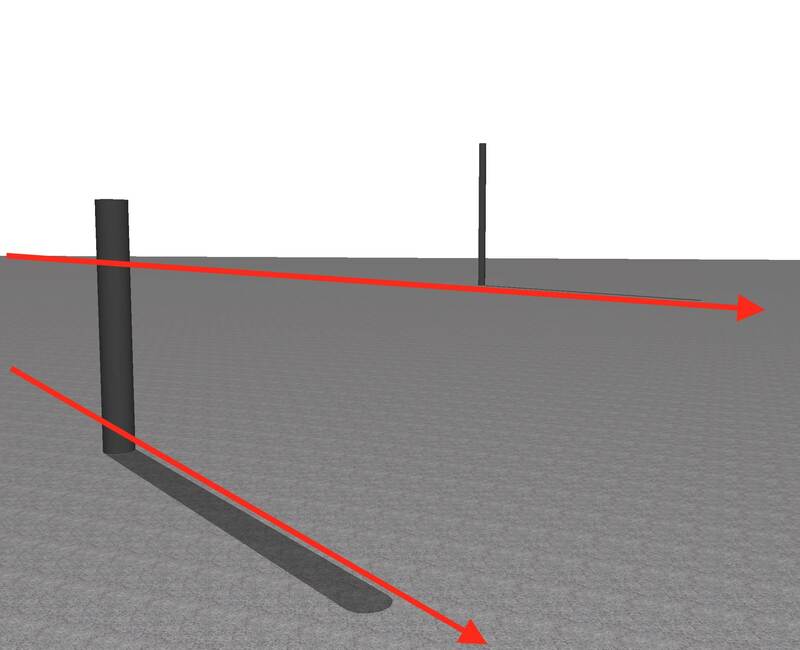 Here - I mocked up a 3D model with an 80 degree view cone with two poles, one 2m high in the foreground and the other 10m high in the background. 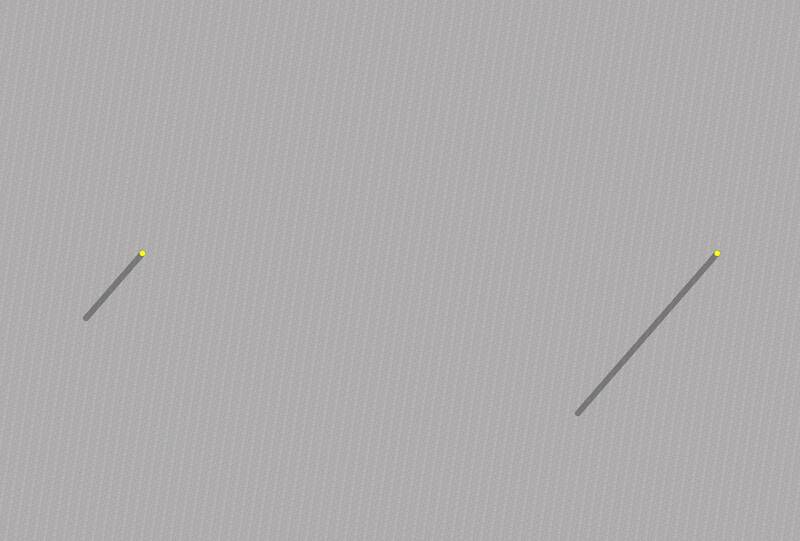 In the plan, you can see the shadows are parallel, but in the 3D the shadows converge to a vanishing point left of view, just as in the moon shot. The "sun" in my model has an infinite distance, which for this experiment is very close to the physics of the sun's rays on the moon. 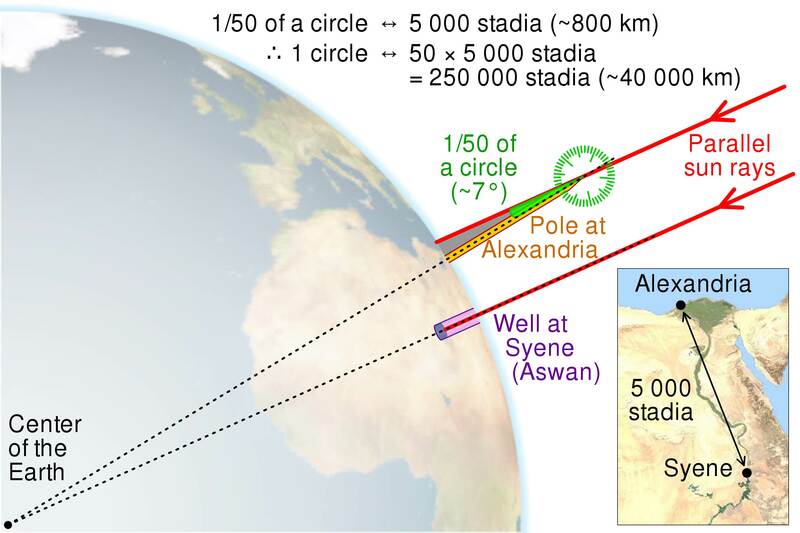 In fact the sun's rays are so close to parallel on earth and the moon that Eratosthenes was able to calculate the earth's circumference and diameter thousands of years ago using poles. The photo is totally consistent with physical optics and the principles of perspective. Why can't we get more shadows like this in Australian Faked Photos? Isn't the Shadow Union strong enough here? ...or is it just the sad fact that Shadow Schools these days just aren't teaching shadows enough shadow skills anymore? It's interesting to note that whether the moon landings were real or fake, either way in just a few short years there won't be anyone left alive that has walked on the moon. If you look at the shadows around you right now you will see they all point away from the source of light. Shadows from the sun will *never* be parallel. Jesus ****ing Christ it will never cease to amaze me how dumb people can be. You see these things all day, every day, constantly, for your entire ****ing life. There is literally nothing else that could be more obvious. Look at shadows around you right now you ****ing dumb arses. How is it even possible to be that dumb? I can't fathom it. Jesus ****ing Christ. For ****'s sake. What the actual ****? It either proves the entire world is a deep fake, and Stanley Kubrik is on the dome controlling a spot light, or some people never graduated primary school art class. Never just sat down with a pencil and drew stuff for fun. I mean... just go outside and look at some shadows. They are all around you, all the time, everywhere. How can you have not noticed this? How? What's this about pots and kettles oh poor petal? It never ceases to amaze me; the lack of observational powers the average person has evilP. Without it, we wouldn't have worked out the earth's circumference over two thousand years ago. 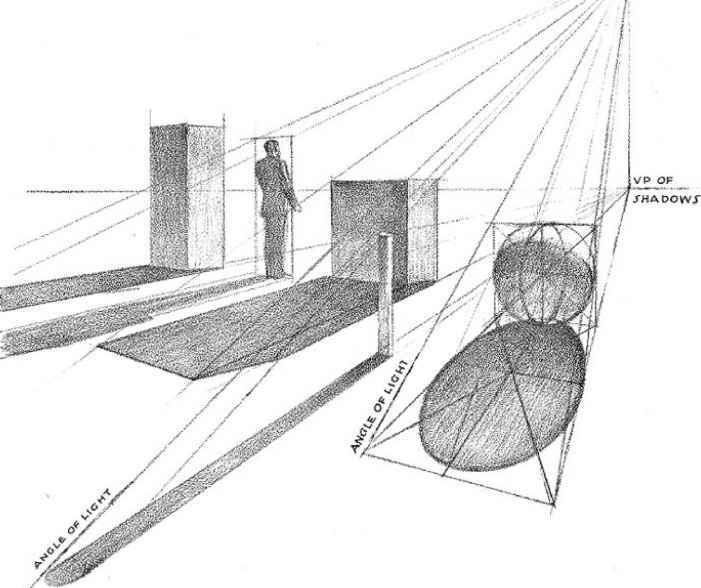 In truth, mathematically in experiments with sun rays, they are defined as parallel although in perspective they are observed as converging to a vanishing point. ^^ Far too complicated an explanation. It's simply because the light source is behind the viewer. They tell us ice crystal formation is reason for those strange lines in the sky that are prevalent over most of Europe and North America. They have excuses for everything. Most are unable to see through the great deception. Same with the obvious faked moon landings. Landing on a light - give me a break. This is a good topic / start for the semi unconscious to wake up to the fact we are being deceived. Bono thinks it is limited to 911 mostly - nothing could be further from the truth. Chicago you say. Have you ever been there? I hear that you can see the skyline from the dark side of the moon, without any distortion whatsoever. I haven't seen it myself but I can pull hundreds of youtube videos of people saying that they can. I think that's where they manufacture chemtrails and vaccines, so maybe its controlled airspace now? Spot on Pete. With all the critical thinking and hard evidence you and Bono have gathered together you should be able to blow this scam wide open in no time at all ! OK I know I'm wasting my breathe here, but I can't stop myself. Pete have you ever noticed that the moon changes shape over a month? And through all these changes, the lit part always points at the sun? Could it be do you think, that is because the moon is merely getting the suns rays exactly as the Earth does? If you want to photograph the moon, you use exactly the same exposure setting as you would here in bright conditions. This is no coincidence, the light source is exactly the same. The moon is no more a light than the Earth is. decrepit said..OK I know I'm wasting my breathe here, but I can't stop myself. Unfortunately decprep you really are wasting your time. Logic is not pm33's strong suit. I'm in Maclean right at this minute and I can see Chicago. Actually hang on, it might be Yamba. In the off chance Japie comes in to some substantial inheritance - he has crossed off any potential vist to the Windy City. A glimpse of the Chicago skyline from across Michigan Bay on a clear day will trigger severe emotional stress. Some folks you see do not enjoy being duped / can't handle the truth. Perhaps with his old age not too far off will come increased wisdom. No wisdom I fancy is the wrong word. Trust is the word I'm looking for here. The word that keeps his mind in a prison without bars. A prison without bars? You mean the real world right? There are STILL some folks on this forum who believe based on trust the fantastic fairytale of 911. Belief in the moon landing is solely based on trust. Not a verifiable fact there. What's your version of events that happened on 9/11 Pete?